Worries about the impact of high speed trading have unnerved investors but the chances of another big flash crash are slim, said Jamil Nazarali, Citadel Securities' head of trading. And he should know. Citadel executes one out of every eight trades in the United States. Nazarali said trading firms have been working closely with regulators since 2010 to prevent a repeat of the flash crash that sent the Dow plunging nearly 1,000 points in a matter of minutes. New rules enacted this year may have helped limit the fallout from last year's glitches that unhinged the Facebook IPO, and the BATS IPO, as well as Knight Capital's rogue algorithm that caused erroneous orders in 150 NYSE-listed stocks. For example, the new limit-up/ limit-down rule forces all exchanges to pause trading in a stock for up to five minutes if the price falls outside of a "normal" trading range -- defined as a price swing between 5% to 10% from the recent range. Nazarali says these pauses help prevent investor panic. Previously it was unclear whether those trades would be canceled by exchanges later in the day, prompting many investors to simply sit on the sidelines. With the new rules, investors don't have to play a guessing game about whether or not a trade will get canceled. The SEC also recently clarified its definition of "clearly erroneous" trades, which usually do get canceled. Eric Hunsader, who runs trading research firm Nanex, thinks the rules will help eliminate some of the glitches for individual stocks, but cautions they may actually make things worse in the event of another flash crash. "These rules are very complicated, and they depend on everyone receiving and processing information at the same time," said Hunsader. During major market disruptions, problems reverberate throughout exchanges and trading firms, making it difficult to process trades. "All these things tend to break when the market spasms," said Hunsader. Internal monitoring: Nazarali's biggest concern is making sure Citadel's automated trading systems don't cause a massive trading glitch similar to Knight's, which cost the firm $440 million. To keep up with the world of high speed trading, Citadel reworks its trading algorithms every few days and puts every new piece of software code through extensive beta testing. If a faulty piece of code does make it through, it would trip a signal inside Citadel and be quickly be shut off to prevent errant buy or sell orders. Nazarali knows how dangerous errant code can be. He worked at Knight Capital (KCG) for more than a decade but left six months before the massive trading glitch that nearly took the firm down. A kill switch: Nazarali won't comment on the problems at Knight, but said he's been advocating for a "kill switch" at major stock exchanges that would allow them to quickly shut down trading from any firm experiencing software troubles. Nazarali said the NYSE detected last August's problems at Knight within minutes, but Knight didn't shut down trading for about 30 minutes. An NYSE spokesperson declined to comment and Knight did not return requests for comment. It's easy to blame high speed traders for the spate of market disruptions. These firms profit from tiny differences between stock prices and they make thousands of trades in a millisecond. That can add up quickly. Critics say high speed trading firms provide liquidity to the market but they can just as quickly take it away at the slightest sign of trouble. Nazarali disagrees. "I think there's very little evidence that that happens." Yet, only public stock exchanges are legally obligated to keep trading when problems arise. Private firms like Citadel can sit on the sidelines if they want. But Nazarali says that stepping back is not an option, because the firm would bleed customers. 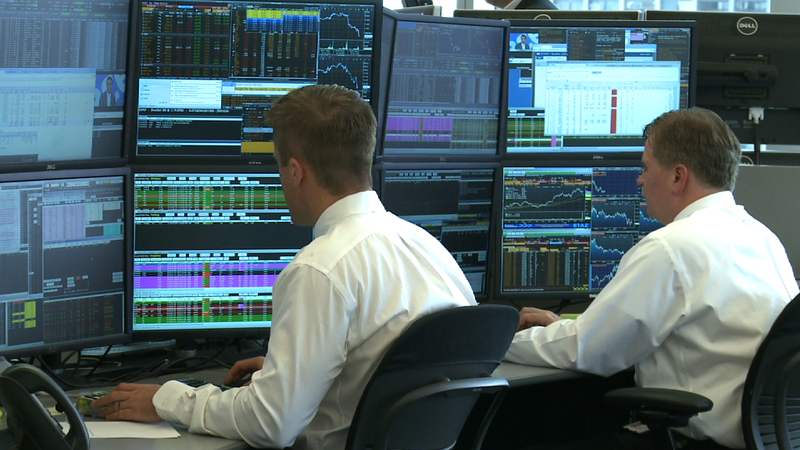 "We don't have to, but we do keep trading because our customers demand it. At times of volatility, that's when our customers expect us to be there." In today's technology driven trading world, Nazarali says customers are actually more protected than the days when floor brokers dominated. "In 1987, during the stock market crash, everything was handled manually, and brokers wouldn't pick up their phones. They wouldn't buy or sell stocks," he said. "Even today, under market duress, people can always get their customer orders filled," said Nazarali. -- CNNMoney's Jordan Malter contributed.